SO… I am not even sure how to start this off.. This isn’t going to be a nicely written, perfect grammar blog.. This is about to raw, written probably so incorrectly that those of you who are grammar-phoebes will probably pull your hair out. But this is going to be written as it has been repeating in my head. I do my best to share my experiences with all of my readers and this is something I definitely feel I should share because I am sure that I am not the only one who fights with this thought. So I recently had a day (well night, because I work overnights) where I experienced triggers/flashbacks, and anxiety. I know what it was that set it off, but it is not my place to speak on it as it does not directly involve me… anyways, so while trying to settle my thoughts and calm myself down (I was on my way to work when it first began) I began to get angry with myself. I mean really angry. That type of anger where you are so mad the only thing you can do is cry. Why? 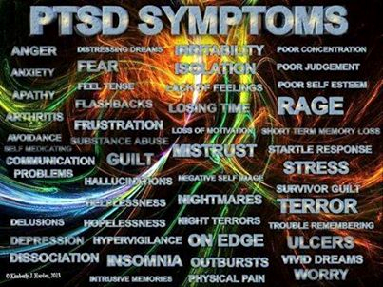 I was angry because of the PTSD, the flashbacks and the triggers. I was angry that even though all these years have gone by since I left him that it is as if I still allowed him to have control and power over my life. Yes, I left him when I was 19 or 20 years old and I am now in my early 30’s. BUT.. I did not start dealing with the deep seeded issue of it until just a few years ago. I knew what I had gone through, but I never fully accepted the fullness and rawness of it all. So I guess in a sense, my healing process is really still in the early stages. Some things, I can get over quick and I deal with it and keep it moving. But this particular time and this ONE THOUGHT seems to really be eating at the core of my soul. It bothers me. To think that he gets to carry on Scott free. Not bothered one bit, not having PTSD or flashbacks due to the hands and the venomous tongue of another individual. It bothers me that at times I still feel as though I am a prisoner trapped in my own mind. Physically I am free.. But mentally I am far from it, and I am the first to admit that! With that being said, I am writing this so that my fellow readers, those who have gone thru what I am going thru to comment or email me with any suggestions you may have for me. You know what this blog page is about, it is about us helping one another and being there for one another. The only ones who truly understand are those who have dealt with it first hand. As always, I thank each and every one of you for continuing to follow and support me with my blogs, and on my social media platforms. You are all greatly appreciated. This entry was posted in abuse, Domestic Violence, letter, survivors, Writing. Bookmark the permalink. Please message me sometime. I have a few ways of coping from my domestic violence triggers and anxiety. Please message me. I have a few ways of coping from my domestic violence triggers and anxiety.